HELL'S KITCHEN — As a gay teenager living in Antigua, Andrew Browne Conwall said he suffered constant bullying. Fellow students at a St. John's school intimidated and harassed him about his sexuality until he couldn't take it anymore and, at the age of 17, he left his native Caribbean island and moved to New York. “I needed to start over, start a new life,” said Browne Conwall, who is now 21. He began living in New York with his mother and brother, but he said things here weren't much better. After two years of incessant fighting with his mom, Cornwall ended up at Covenant House, a shelter for homeless youth located near Times Square. Next week, he will step onto a stage to share these experiences for the first time with a live audience. “I wanted people to be aware of what bullying is and see you can overcome it,” the novice actor said about his decision to be part of the performance. He performs alongside 10 other actors, all from the Covenant House, who recount their past experiences of racism and social exclusion. The performance is free and expected to last about 30 minutes. For Walton, that includes plans to attend AMDA Performing Arts College and Conservatory next year. 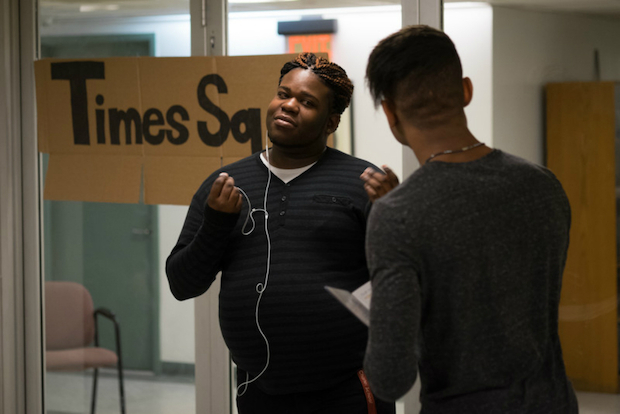 The young performers, who have all experienced homelessness at some point in their lives, started rehearsing the play in August as part of Covenant House NY’s Creative Arts Program. “A lot of these kids have been through a lot,” said Roland Grayzel, Covenant House's director of program development. “[The play] is a good way to address their traumas." Ricky Fields, a 22-year-old who plays a young man struggling to tell his friends and relatives that he is gay, said he'd always wanted to give acting a try. “But sometimes it can get very awkward because there is a huge parallel between this character and me when I was in high school," Fields said. The performance — a first for the homeless shelter founded in the late 1970s — was made possible by Theater of The Oppressed NYC, a nonprofit that supports productions that confront social, economic and human rights issues. The play will be followed by a one-hour public forum, during which audience members will be invited to share their thoughts about the situations faced by the youth in the play. “We want the audience to feel solidarity with the actors on stage,” said Theater of the Oppressed NYC Executive Director Katy Rubin, who helped the actors create and rehearse their play. “Then we’ll all brainstorm together about new solutions to address these issues." Tickets for “The Outsiders: Black, White, & G(r)AY” premiere performance on Nov. 17 are now sold out, but the troupe just added another performance on Nov. 24 at 7:30 p.m. The show will take place at The Lion Theater at Theatre Row at 424 W. 42nd St. It is free but tickets must be reserved in advanced via this link.